Home > Bowls & Feeders > AutoPupCup Blue - Large - 20oz. AutoPupCup Blue - Large - 20oz. AutoPupCup - Blue - Large - 20oz. 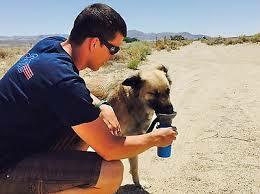 This revolutionary travel-water mug is fantastic and is flying off The Doggie Bag shelves! Easy to use and ergonomically designed for dogs to easily lap up water. 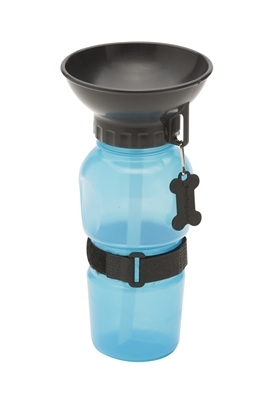 Squeeze the bottle to fill the top and let your dog have a drink. Any extra water drains back in to the bottle when you release pressure. Fits in your auto cup holder. Non-spill top, leak tight, food safe and BPA free. Large size includes attachment strap. Made in the USA.